Right in the middle of moving into the new place and during all the commotion of unpacking 400 boxes of aggravation and robots my wife had to go and have her birthday this week. Usually I would welcome the pressure of trying to make it special with presents and crap but this is not a good time during all the upheaval, stress and chaos of the move. Plus in our current situation she's the one with the job so anything I "buy" for her is technically her buying herself something with her own money, except I'm the surrogate handing it to the cashier. I didn't know what to do that could possibly be special or exciting. Then blessed misfortune stepped in and ruined my day in a lucky way. Last month we got 2 tickets to a Rob Thomas concert that's happening tonight but we couldn't get a babysitter. My wife wanted to just get rid of both tickets but I told her not to, instead we kept one so she could go to dinner and the concert with a girlfriend of hers from work while I stayed home. The Queen of Macrocrania ended up extremely grateful and I end up smelling like roses, taking one for the team and giving her the gift of Rob Thomas. It sounds like it'll all turn out fantastic and this'll be one of her best birthdays ever except for one small detail-I am ten billion times the Rob Thomas fan she is and she never would have heard of him if it weren't for me and half the time she doesn't even know it's him when the radio's playing Matchbox 20 and it all really pisses me off and I'm really disappointed at not being able to go. Not only am I jobless but now I am Rob-less. Now that I think about it, we need to get groceries so I am also corn on the cob-less and ever since I sold off my GI Joes I am Snow Job-less. Also, tres miserables! Accepting that I did not have the power to overthrow Rob Thomas' brain and take over his life by displacing his soul in his own body was very therapeutic for me. I'd always put that guy up on a pedestal and it was painful but I accepted I couldn't be him a long time ago. I was always kinda hoping I could at least see him in concert, though. Maybe life is trying to tell me that the road to happiness runs not through Rob Thomas' cerebellum but a lot lower. As in I need to get crappier heroes. 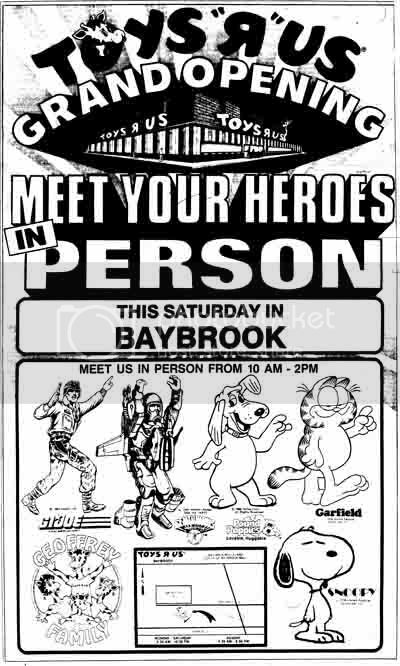 It reminds me of this Toys R Us ad from 21 November 1986. Toys R Us knew your heroes should be furrier than you. I should have been looking up to Garfield the slob and Snoopy the dog suffering from World War II post traumatic stress disorder and that Pound Puppy guy on doggy death row. With depressed and insane heroes like that who needs self confidence? I guess if I grew up worshiping Pound Puppies I'd probably get bouts of low self opinion when my wife went to the dog pound and I'd be finding reasons to wish I was one of the animals. I could hear myself now thinking, 'Man those dogs may not have a real home and they may be sentenced to death but they're probably all better than me in that they are not lactose intolerant'. So on this night when I celebrate every wrong decision I have made in life that has led me up to this point I think I will turn to the ol' standby, that opiate of the masses, that secret weapon against mental breakdown, that trump card in the game of life-BitTorrent. While my wife is away I'll download a bunch of japanimations and watch them while she's out listening with all those countless other posers to songs Rob wrote for me and me alone! Songs about my life, like that one called "Bent" that he could only have written knowing the pain of getting a dent in the plastic bubble of a carded G2 Stunticon. Somehow with the help of Bram Cohen, Tranzor-Z and several gallons of Mountain Dew I will make it through this night and emerge triumphant and know a success that all the neurotypicals who go to Rob Thomas concerts will never know. I will have the strength of character that can only come from staying at home while everyone else is at the Hard Rock watching Rob Thomas sing about my life while I am watching Japanimation toy robots cartoon marathons alone! I will turn this thing around! I will unbend that which is bent! I will free all the lactose tolerant Pound Puppies of pessimism from the dog pound of discontent that is my mind! I will make being a loser my greatest strength! GODDAMNIT I WILL FIND A BABYSITTER NEXT TIME! quick! Who is furrier? You, ROb Thomas or a pound puppy? I'm easily furrier than a Pound Puppy or Rob Thomas. I haven't had a haircut in over 9 months. I tell you, man. Mo' fur, mo' problems. If you keep that up, you might end up furrier than Prime.